'Can' Packaging from Beer World Work with Wine Too? ‘Can’ Packaging from Beer World Work with Wine Too? A rose by any other name would smell as sweet, but does an aluminum can always signal a low brow beverage? Less than ten years ago, canned beers were limited to low-flavor, mass-produced macrobrews. A small craft brewer decided to change that stigma. In November 2002, Oskar Blues Brewery in Lyons, Colorado launched its “Canned Beer Apocalypse.” Dale Katechis decided to can an assertive and flavorful Pale Ale, one can at a time. With an expanded lineup of bold and critically acclaimed canned brews, great canned beer is no longer an oxymoron. Now, over 130 craft breweries can beer, including Oskar Blues’ much larger neighbor to the south, New Belgium Brewery. Canned beer wasn’t historically always associated with microbrews. In fact, a small regional brewery was actually the first to produce beer in a can. On January 24, 1935 Krueger Brewing Company released the first commercial canned beer in Richmond, VA. Within the year, Pabst and Schlitz entered the fray of the canned beer world. Now, most beer, micro and macro alike, can be purchased in either glass bottles or aluminum cans. While it may seem to be a new phenomenon, canned wine has almost as long a history as canned beer. Yvonne Horn describes the largest collection of canned wine in the world in a San Francisco Chronicle article in 2008. Collector and winemaker Allen Green, has approximately 400 wine cans dating back to almost the same year as Krueger’s canned beer. In an attempt to join the canned beer bandwagon, Acampa Winery in Lodi, CA canned Acampa Brand California Muscatel in 1936. Other early examples are rare, but in 1954, Yosemite Winery of Madera canned Carina Kan-o-wine California White Port and the Bacon Liquor Company of Hartford, Connecticut canned Mother Goldstein New York State 100% Pure Sacramental Concord Grape Wine. And don’t assume that wine in a can pioneering was limited to the United States. In 1971, canned Beaujolais was imported into the U.S. I can only imagine the possibilities for Beaujolais Noveau if Georges Duboeuf tries to rekindle the past. One of the main advantages that Ball’s Vorlage sees is aluminum cans’ superior shipping qualities. This attribute led to United and Delta Airlines’ partnership with Taylor California Cellars to sell canned wine on their airplanes in 1980 and 1981, respectively. Back in the early 1980s, the airlines were looking for ways to save costs by reducing weight and fuel bills. At the time, a case of 48 6.3-oz cans weighed less than half of the same volume of bottled wine. With the increase in thick and heavy bottles in the market today, small metal cans may be even more attractive to airlines today. The current biggest player in the canned wine industry comes from the Land Down Under. Since 1996, Australia’s Barokes has been developing and patenting a wine packaging system that enables quality wine to be canned with product integrity. Barokes touts that their cans (both in 200 mL and 250 mL sizes) are an ideal beverage container that is both airtight and light-proof. The cans, using Barokes Vinsafe™ technology, can be found in 27 international markets and Barokes offers licensing agreements for companies wishing to can wine. The Ball Corporation has a licensing agreement with Barokes to bring canned wines to the Americas and Europe and two American wineries are working with Ball to bring canned wine to a store near you. Francis Ford Coppola Winery in Geyserville, California offers nine different wine brands; one of which includes a canned sparkling wine. 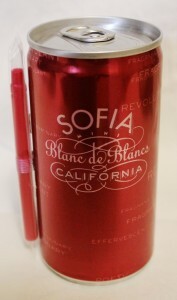 Francis named his lineup of blanc de blancs sparkling wine after his daughter, Sofia. A blend of pinot blanc, muscat, and riesling, Sofia is sold in traditional 750-mL glass bottles or as Minis in a single-serving 187-mL can. To make the Mini even more user-friendly, each can is adorned with a telescoping straw. The Minis sell for $5 a piece, or $20 for a four-pack. If you haven’t spied the pretty pink package of Sofia perched on a retail shelf, you might have seen a Prosecco product peddled by a paparazzi princess. In 2006, socialite Paris Hilton made news for becoming the celebrity spokesperson for Rich Prosecco. Much of the discussion in the media focused on Hilton’s provocative advertisements and not the wine’s aluminum packaging. With a product relaunch in 2010 that added canned mixed spirits to the lineup, Rich now sells seven different products with names such as Fire, Vampire, Ice, Champers, Venice, Secco and Secco Rosé. Clearly, with racy names, unique packaging and a sassy celebrity promoter, Rich is marketing to a younger, glamour-seeking audience. Oddly, these Italian wines are not for sale in Italy because wine may legally only be sold in bottles in Italy. However, the largest markets for Rich are Germany and Austria. 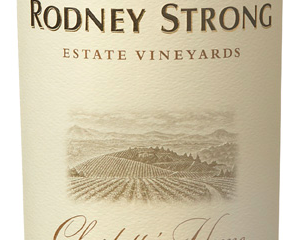 After the initial media attention in the U.S., very little has been seen of these wines domestically except for Hilton’s occasional marketing trip to Germany. 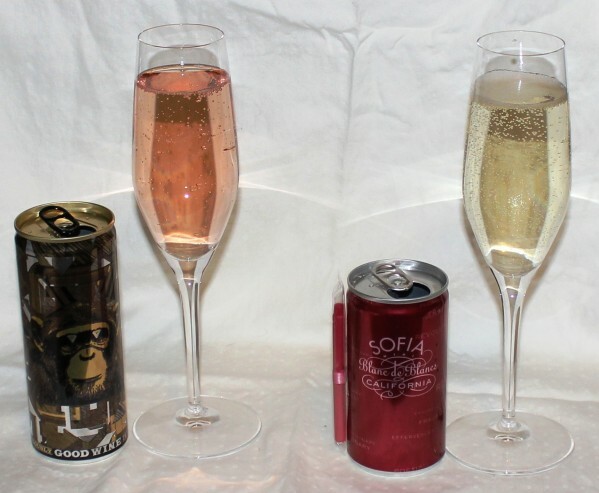 Nevertheless, the canned-wine industry is picking up steam. 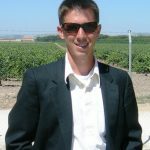 Despite getting into the European market a few years ago by building a cooperative packing network that allows wineries to can wine, Vorlage said Ball is intent on, “building a domestic brand for canned wine.” Ball realizes that cans are not going to replace glass bottles, but will provide an increasingly reputable alternative. It just so happened that, a Colorado vintner approached Ball with a unique idea. 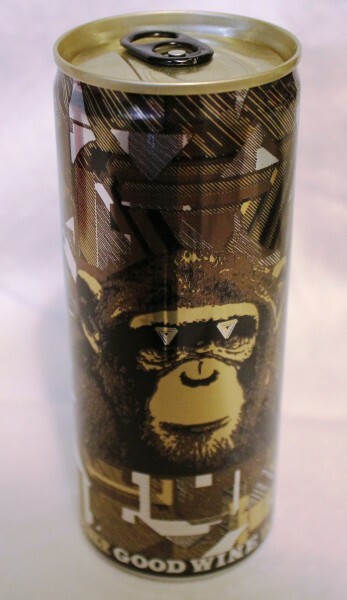 Ben Parsons of the Denver-based Infinite Monkey Theorem (IMT) wanted to can a sweet, sparkling wine for local distribution. While Ball had never worked with a winery as small as IMT, they worked with Cask (the same canning line that Oskar Blues uses) to develop a canning line small enough to fit into Parsons’ small urban Quonset hut that IMT calls home. In a somewhat risky move, Parsons recently released his canned carbonated Black Muscat at the posh Aspen Food & Wine festival this past summer. The can has met with huge success, though it is only for sale in Colorado due to its non-traditional 250 mL size. The wine is already available in more than 50 Colorado retailers and Parsons plans to increase production. This past fall, I had the opportunity to work the canning line for a morning. Two at a time, cans are filled and then sealed by hand. Stacked in custom (i.e., freshly made) crates, the cans are then personally delivered to eager retailers and restaurants. The overall goal of canning wines is to provide a fun, exciting and environmentally conscious wine delivery system to young, enthusiastic wine consumers. “If we can make the cans affordable and just allow the consumers to try them, they can decide for themselves if cans are something they will support,” says Vorlage. 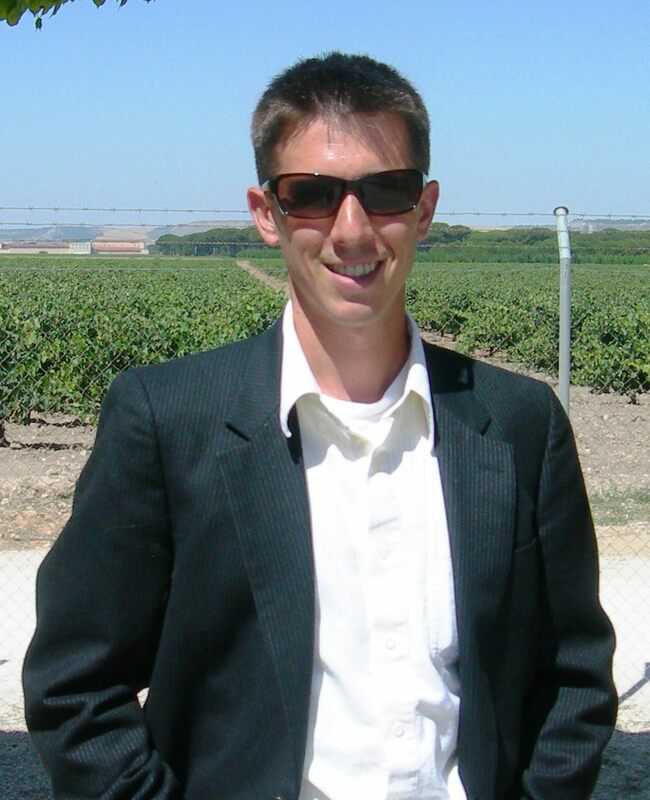 “Once consumers get familiar with cans and understand the sustainability aspect (they are infinitely recyclable, sustainable to ship, chill quickly), they will see the value of wine in a can.” Ball, and all of the wineries that use cans, believe that this type of package has inherent properties that will make them successful. If the Denver consumers’ enthusiasm for a local winery’s attempt to challenge traditional wine convention is any sign, wine in a can has a shining future. Sure, why not? If a can is good enough for beer, it’s good enough for wine. Beer, wine, can, glass bottle– just give me a drink and I’ll be happy. Now only if there were a few more canned wines from which to choose!